Kelly joined Tickle Law Office in 2018 as a Paralegal. She is a graduate of Vance Granville's Paralegal A.A.S. Program, a Notary Public and fluent in Spanish. She is currently attending NCCU's program to receive a Bachelor of Science in Criminal Justice. 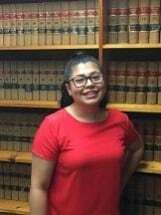 She has several years experience working in the fields of criminal law, civil law, and immigration law. Contact Kelly to schedule your consult with our firm! !